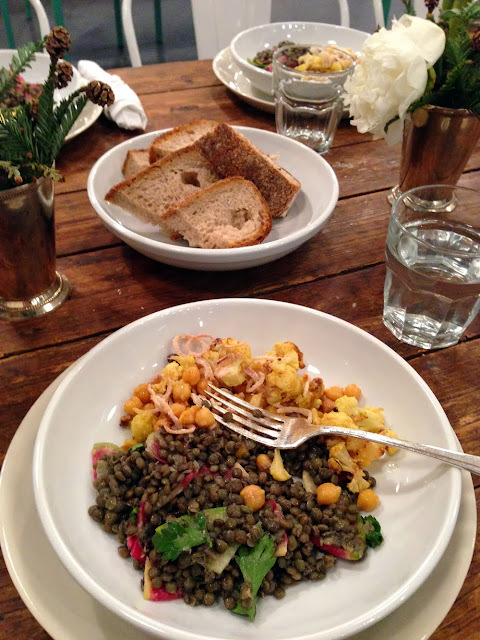 I recently attended a class at Haven's Kitchen, which is a café, cooking school and event space in NYC. I love that their goal is to help people learn about real food and to get them around a table together. This video does a great job of explaining what Haven's Kitchen is all about. Note: This is not a sponsored post; I'm sharing this experience with you because I really believe in what they're doing. 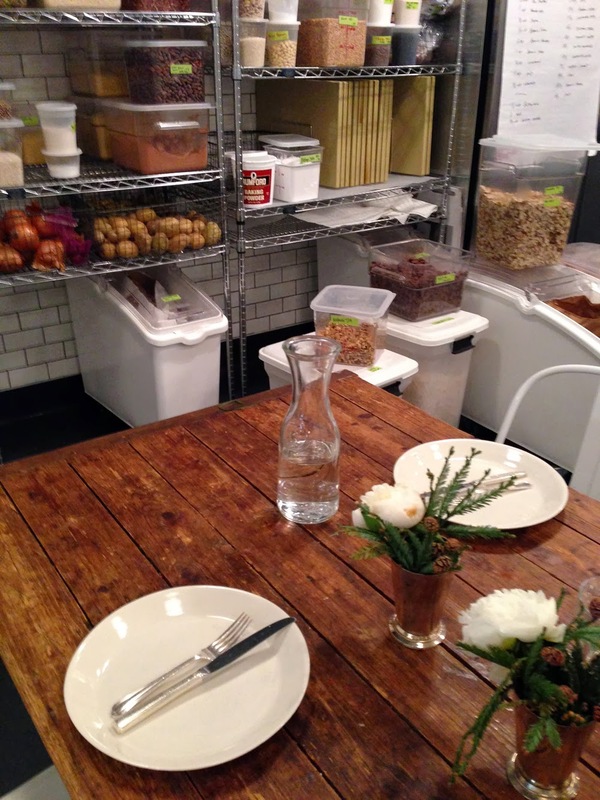 The whole space is gorgeous, the food is incredible, and the class was a lot of fun. Usually after their classes, the students and chefs sit down at a beautiful farm table in the kitchen (below) to eat what they prepared together. This class was a little different - since it was a class on edible gifts, we got to take home all the food that we made (bonus!) so they served us lunch from their café instead (pictured in the last photo in this post). 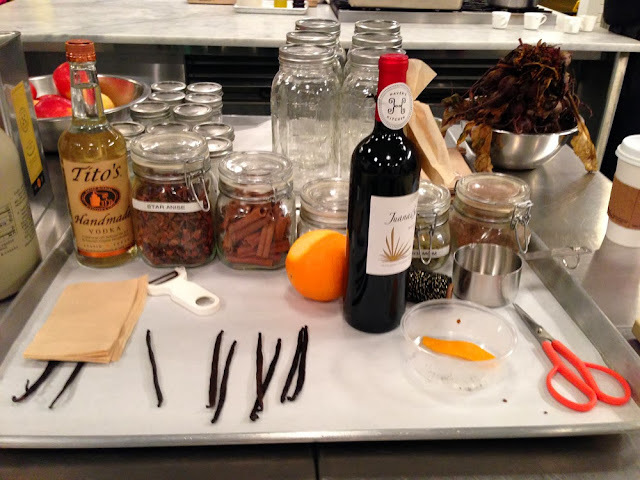 Executive Chef David Mawhinney guided us in making some fantastic DIY holiday gifts. It only took a few hours to whip these up, and now my "gift closet" (really a portion of a kitchen shelf) is stocked with homemade gifts ready when I need them. 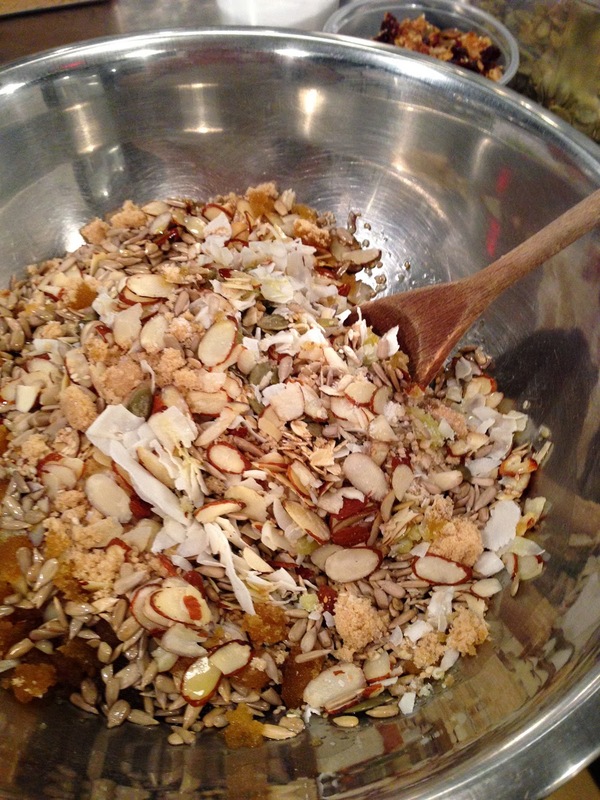 During the class we made granola, vanilla extract, pickled beets and celery, mulling spices for wine, layered cookie mix, and apple butter. I think their idea of a sachet of mulling spices tied to a wine bottle (you can see this pictured in the photo above) is pretty brilliant. It's more thoughtful than just gifting a bottle of wine, plus if you warm the wine and spices during a party it makes your home smell amazing. Chef David recommends a fruity red for this gift. Ina Garten has a recipe for mulled wine. This was my first time pickling vegetables, and it was actually a lot easier than I had imagined. A mix of toasted spices and vinegar is poured over roasted beets and raw celery. 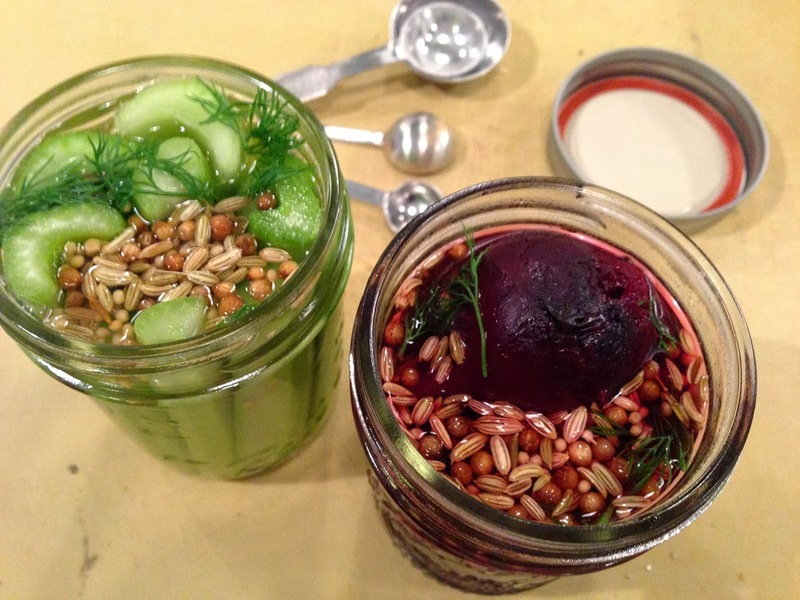 Martha Stewart has a great how-to guide to pickling. Chef David suggests the pickled celery as part of a Bloody Mary mix gift. I think that's a great idea! Haven's Kitchen sells their granola on-site at their café, so I don't think they'd like me to publish their recipe (they were even reluctant to give it to us students!) But there are endless variations of granola recipes - I recommend using Bon Appétit's "Everyday Granola" as your starting point, and adjusting the nuts and fruit to your personal preference. 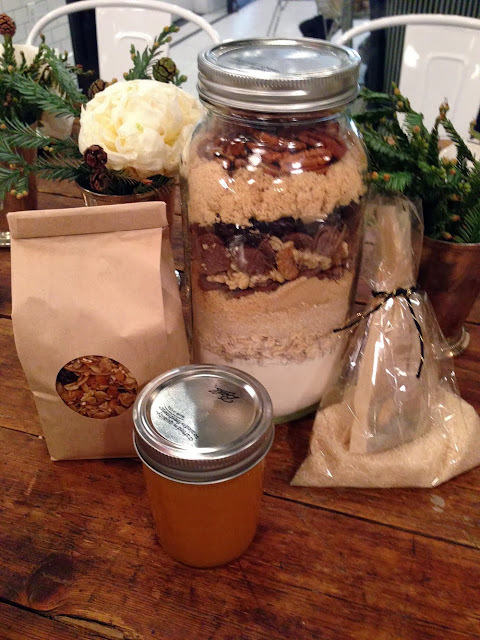 The layered cookie mix jar (above) would look really pretty with a recipe card attached. 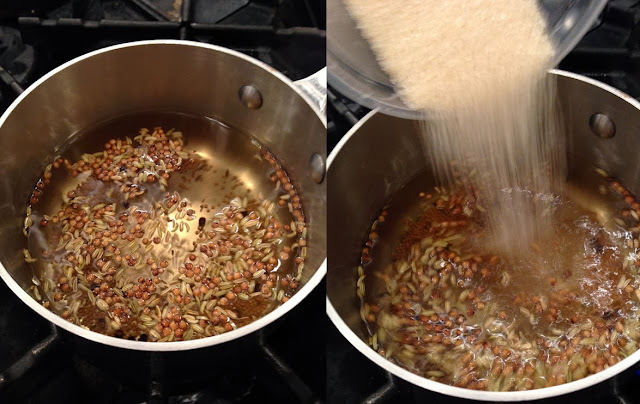 The idea is that the recipient just needs to mix the dry ingredients with whatever perishable items the recipe dictates. You can do this easily with your own favorite cookie recipe - just mix the baking powder and salt into the flour. Chef David's tip: for the prettiest layers, make sure you put the flour and sugar on the bottom, and the larger items on top - if you tried it the other way around, the flour and sugar would fall through to the bottom and everything would mix together. If you want to really impress, you can place the jar in a market tote with the dairy items included. If you're in the NYC area, you should check their calendar and sign up for an upcoming class. This would be a really fun date or group activity, and a nice change to the usual routine of dinner and drinks (but don't worry, most classes do involve wine!) For all you hostesses out there, they have some really great classes coming up this month: "Easy Entertaining: Holiday Party," and "Cocktails for a Crowd: Champagne Cocktails and Bar Snacks" - festive for the season, and skills you can use year-round. Perfection!